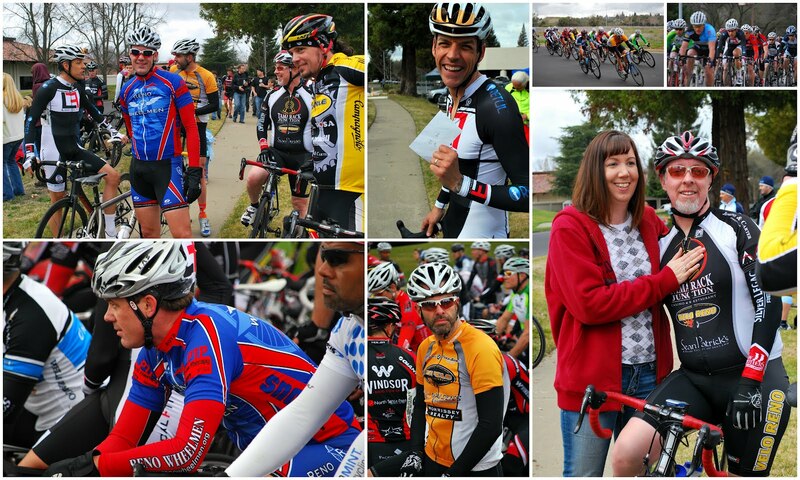 Saturday was the kickoff for John's road bike racing season with a strong start at the Folsom Criterium. Since the race venue was just two hours away, we drove down early Saturday morning to Folsom, CA. I think he felt pretty good that day because he was off the front a few times. Then it was a sprint to the finish and John came in second in the Men's Cat 4 right after his teammate, Mike, who took first place in that race in a field of almost 70 riders. After that there was one more race in the Men's Cat 3/4 and Masters 35+, this time with several more of his teammates. It was a fast loop, equally exciting to watch as it would be to compete. When it was all said and done, John finished 4th place after slowing down to avoid a crash between to other riders. Not bad considering there were 85 riders competing for the podium. John always says the best part about racing is when it's over. That's when the stress is gone and you realize how much fun it was. Afterwards we went to eat at a place called Dos Coyotes which is in a little shopping mall right next to the race location. There are more photos of the 2012 Folsom Criterium Bike Race on my Picasa Web Album. I have videos of the finish I hope to upload soon. When are we going to see you up there? I love the spirit of competition and watching the women race gave my butterflies in my stomach but, well...I've pretty much given up on the idea of racing in criteriums and maybe even road races (these two styles require riding too close to other riders for my comfort). Mainly because I don't want to crash...and it's not so much 'crashing' that I dread but I don't want to ruin my skin in the process (I know it sounds vain). I've had friends crash several times, during training and in a race and the road rash is pretty bad, not to mention the scars they will leave behind. The marks are almost always on the arms and hips. I still have scars from crashing on my own, on the inside and outside of my forearm and on my hip and it just looks terrible. I would still like to compete in less risky events such as a time trial and, actually, a duathlon this June (riders are not allowed to draft so if I crash, it will be because of my own doing).